In Making History, Fry has bitten off a rather meaty chunk by tackling an at first deceptively simple premise: What if Hitler had never been born? An unquestionable improvement, one would reason--and so an earnest history grad student and an aging German physicist idealistically undertake to bring this about by preventing Adolf's conception. And with their success is launc In Making History, Fry has bitten off a rather meaty chunk by tackling an at first deceptively simple premise: What if Hitler had never been born? An unquestionable improvement, one would reason--and so an earnest history grad student and an aging German physicist idealistically undertake to bring this about by preventing Adolf's conception. And with their success is launched a brave new world that is in some ways better than ours--but in most ways even worse. 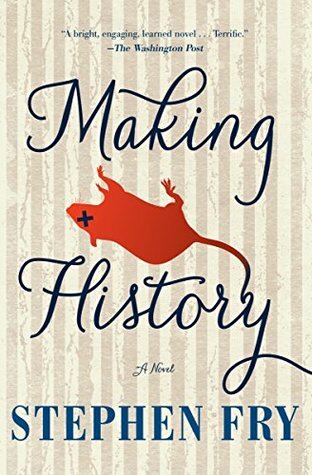 Fry's experiment in history makes for his most ambitious novel yet, and his most affecting. His first book to be set mostly in America, it is a thriller with a funny streak, a futuristic fantasy based on one of mankind's darkest realities. It is, in every sense, a story of our times.